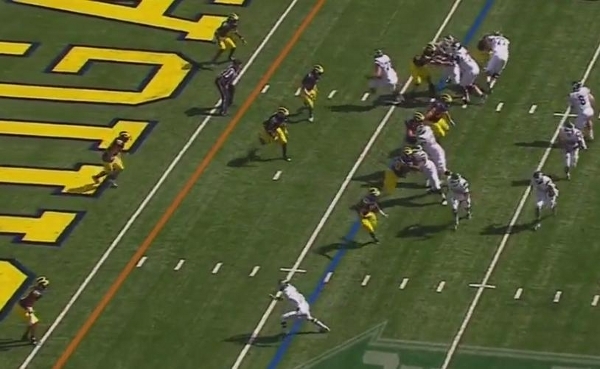 Yesterday, I diagrammed an Eastern Michigan jet sweep that went for 18 yards because of indecision on Kenny Demens' behalf. Of course, the analysis gods wanted us to see that play again and wanted to give Demens an opportunity to redeem himself. It's the end of the first quarter and Eastern is driving and in the red zone. They come out in a two-wide set with a tight end on the backside of the play and an H-back and RB on the playside of the field. 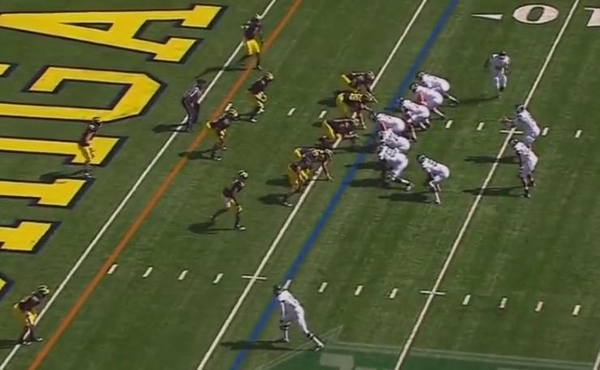 Michigan is in a 4-3 under formation with Jake Ryan as the EMLOS (hey!). Demens (red) is lined up over Eastern's running back. Before the ball is snapped, Eastern's wide receiver will sweep across the formation. 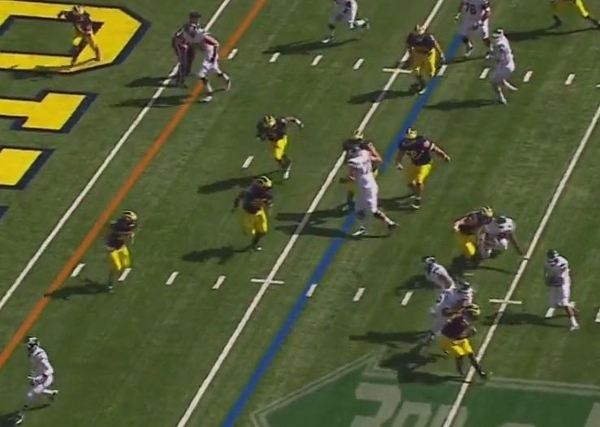 Like before, Michigan is in zone coverage so no one follows him. 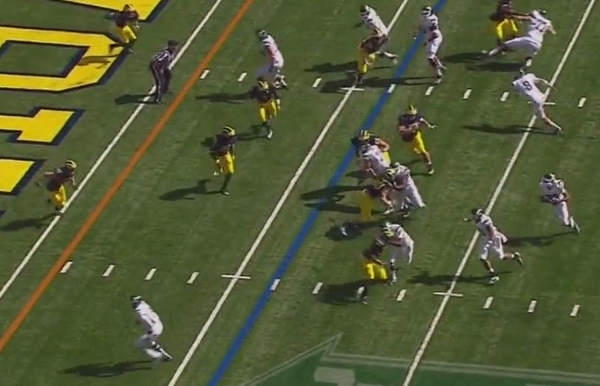 After the snap, the H-back and running back immediately step to their left to block. As Alex Gillett and the wide receiver get to the mesh point, you can see Demens is already taking a step to the playside. In the last instance, Demens is still flat footed at the mesh point. 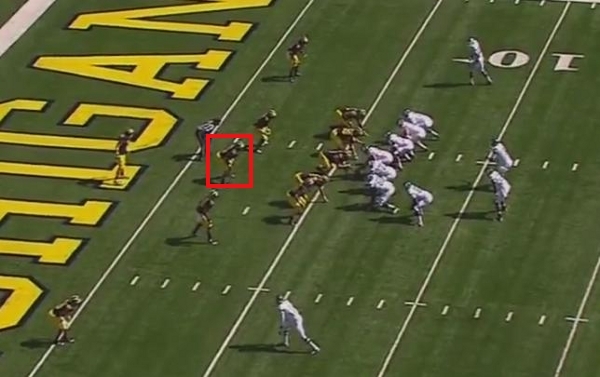 Here, Demens is looking into the backfield at the ball carrier rather than locking onto Gillett, and following the play. 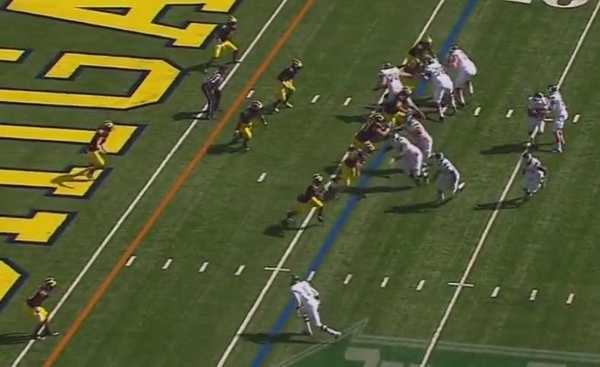 Meanwhile, Thomas Gordon is headed upfield as the contain defender forcing the play back inside (this is key to Michigan's success defending the play). 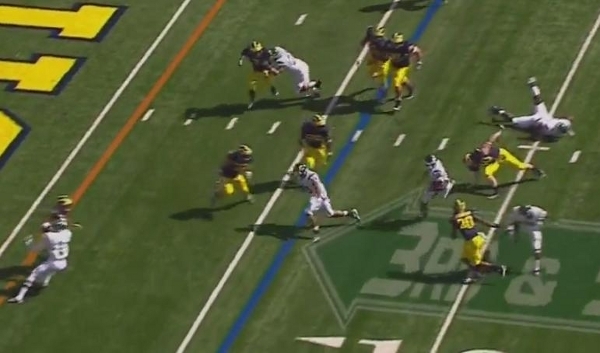 Demens is staying in line with the ball carrier, being careful not to over pursue and open cutback lanes. You can see Gordon on the bottom of the screen being pushed upfield, but he has successfully forced the play back inside. The lead blocker is heading upfield looking at Kovacs and Demens bearing down on the play. Demens is in full sprint toward the play. Kovacs is about to engage the lead blocker and Demens will come in behind them to make the tackle (with help from Gordon who has beaten his block). Much like last year, Demens went from a culprit of blown coverage/leverage to recognizing and attacking a near identical play in short order. While I do have my concerns that Demens seemingly needs to screw up before he succeeds, its impossible not to be impressed with his ability to learn from those mistakes. We've now see it with two different defensive staffs (one of which was mostly incompetent), so it's likely that Demens recognizes his mistakes himself, in addition to being coached up.